This bus can burn up to 40% less diesel than a conventional bus and up to 80% less harmful exhaust emissions compared to older buses. The bus automatically stops and starts the diesel engine only when required. It is designed to glide silently around passenger areas such as terminals and bus stops, this reduces noise and harmful emissions near where people are located, making your journey a more pleasant one. The bus contains just one Hybrid battery which is charged using the braking energy each time the driver touches the brake pedal so it’s ‘free energy’. It is probably the most versatile driveline solution there is when it comes to combining environmental improvement with performance, economy and uptime. The Volvo B5 Hybrid has active temperature-controlled lithium-ion battery cells, with individual cell charge control. This results in reliable and efficient energy storage. The lithium-ion battery has high energy-storage capacity, low weight and low environmental impact. It is optimised so that the Hybrid can run everywhere, regardless of climate. When you save as much as 40% in fuel consumption, you also reduce CO2 emissions by the same amount. And when it comes to nitrogen oxides and particles the reduction is even greater; up to 50% compared to the average Euro 5 diesel bus. The reason why Volvo can present better figures than others is no secret. The solution itself, the parallel hybrid, is highly efficient, the Volvo I-Shift gearbox provides optimised conditions, and we keep the batteries in the best possible condition by providing both cooling and heating. MTD partnered with Auckland International Airport Ltd and operator Bus Travel NZ Ltd to trial the first Volvo Hybrid Bus in New Zealand on their Park & Ride service in November. Auckland Airport also has a strong focus on reducing energy consumption as well as emissions. The Volvo Hybrid trial aimed to demonstrate the significant savings possible with this bus in both fuel and harmful emissions during trial. It’s no mistake that the bus can also silently operate in ‘electric only’ mode, gliding past the terminals making almost no noise and creating zero emissions. At higher speeds the diesel engine takes over while at the same time recharging the batteries. Since the electric motor serves both as a motor and a generator you actually recharge when driving and braking. While idling at a red light or bus stop the diesel engine is shut off, resulting in zero emissions. Worldwide trials to date have shown fuel savings of up to 40% vs a conventional diesel bus on the same route but equally important are the greatly reduced exhaust emissions and the bus’s capability to operate in silent ‘electric’ only mode. This is proving a real bonus in the airport environment. The bus traveled between the Park & Ride stops and the Domestic and International Terminals. That trial was a huge success with the Volvo B5 Hybrid achieving an average of 38% less fuel burn than the incumbent fleet (MAN) with zero downtime during the trial. The hybrid was stationed at MTD prior to Christmas break, so Clive Jones, Volvo Bus Manager, seized this opportunity to take some interested staff around the streets of Palmerston North. Which was enjoyed by those who came along for a ride. 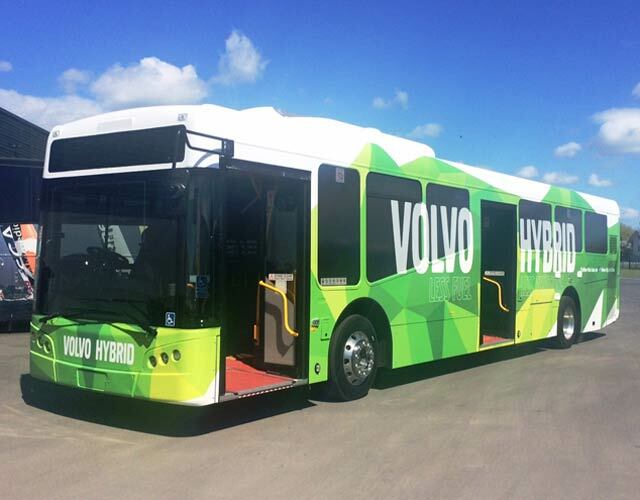 The Volvo hybrid is in Wellington now on trial with the Greater Wellington Regional Council. They offered public a day to experience the low emission, modern bus technology and travel for a day. The single-decker bus ran along the Golden Mile, between Wellington Railway Station and Courtenay Place, allowing people get on board, for free, and feel the difference. Regional council transport portfolio leader Paul Swain said that 10 hybrid buses would join the fleet from 2017 and would significantly reduce emissions produced from public transport. However, unlike the demonstration bus, the new ones would be double-deckers. “They will be bigger, just like they are in London, but not red. The new buses and all of the region buses will be painted in the regional council’s green” comments Swain. GWRC has commented that this is an important step in the future bus product offering for us in NZ and although at the present time we don’t have the exact product specification required to suit New Zealand’s axle legislation, the technology deployed in the trial bus in terms of the Hybrid operating system is very well advanced within Volvo Bus Corporation with more than 2200 units operating worldwide.